My homeland Modena must miss me. Since I moved to Salzburg things started to go pretty bad over there. There could be many different thoughts I could share on my blog talking of this last disaster. But pouring out my wrath about politicians and administrations would mean simply picturing them in a bad bad bad light, and this is entirely too easy! I have standards too, I cannot lower them further than they are right now. Even though, in that case I would have to start digging, and digging canals and navigations could be useful in this time of flooding. But I am not an engineer, and besides I have a painful spinal disc herniation, so I’d better leave digging for another time. Therefore, let us focus on another thing: Italian media are ignoring the tragedy . enthusiasm should be kept in perspective. Nevertheless one must admit that, although we did not impress the Italian press – outside Modena, of course -, this NYT blog did list “us” among the pictures of the day, as the no. 5 of the 20th January more precisely, among other pretty bad situations all around the world (clashes, bombings, other massive floods). The flooded territories are located between two rivers, the Secchia (the one that literally poured out when the levee in one of the north suburbs of Modena broke, and the Panaro. Their courses come closer shortly after the city of Modena, in its immediate northern outskirts (suburbs of San Matteo, Albareto and Navicello), and they flow this close until after Sorbara/San Prospero and Bomporto. The Secchia has flooded all the territories to the river Panaro, thus resulting in a terrible flood also in the before-mentioned town of Bomporto (where, by the way, I used to live prior to my migration to Salzburg). Bomporto is located on the river Panaro and has an old bridge crossing the Panaro itself, connecting Bomporto to Casoni di Ravarino. While chatting with Gabriele on my Facebook account about US troops and Modenese rivers I recalled my researches for the Historical Dictionary of Modenese Antifascism, which included consulting a huge amount of orders of battle to understand more of some local biographies (partisans fighting here and there, old books reporting things I found a little suspicious or unlikely). Due to my focus, I only went to Berlin and Freiburg to research directly in the archives for German diaries. Nevertheless, I looked up a few second-hand things about the Allied troops as well. So, I stumbled upon the march of the 10th Mountain Division, marching on Bomporto, or better, occupying its bridge, which was considered strategic. These facts are stated, for instance, on this site and even on my not so beloved Wikipedia, where a footnote about the occupation of the Bomporto bridge on the river Panaro leads to “Young, Gordon Russell (1959), Army Almanac: A Book of Facts Concerning the Army of the United States, Washington, D.C.: United States Government Printing Office”. The real-life Trapp family, the one you probably know from The Sound of Music, escaped to the USA (not to Switzerland), had Italian citizenship and had two boys who were sent to serve in the 10th Mountain Division, Rupert and Werner. According to Maria’s and Agathe’s memories, they were indeed fighting in our territories: Agathe mentions Mount Belvedere, which is between Lizzano in Belvedere and Montese. Montese hosted a well-known battle, where the Brazilian Army fought bravely. Moreover, Montese lies in the upper part of the Panaro valley and drainage basin. I have absolutely no evidence that the two Trapp boys entered Bomporto on that April day in 1945 but somehow I can picture them descending with their division the paths leading through Marano, Vignola, Castelfranco, Nonantola to Bomporto. Who knows if they did? Well, I would know how to find out this, but unfortunately I have other projects scheduled as soon as my herniation gets better, so this particular inquiry will have to wait. (About the Trapp family, Maria A. Trapp, The story of the Trapp Family Singers, and Agathe von Trapp, Memories before and After The Sound of Music, as well as their official website). Mr Sheffield: And the moral of the story is? Fran: Everything has to have a moral? What am I, Mother Goose? – I would hope to draw some attention on this troubled land and raise some awareness about the situation: yes, it is my personal affection and concern since I was born and raised there, my family and friends are still there. But it is also a land which used to contribute alone to the 1% of the Italian GDP before the earthquake and which is slowly dying due to the stubbornness of the government and of the local administrations, neither granting any tax free time range nor investing in the local reconstruction. Instead, they focus on other “investments” I would not be proud of. But this is an issue I would not like to address. This land produces a lot of fine eno-gastronomic specialities, excellent biomedical technologies, beautiful cars, and moreover hosts exquisite architectural and artistic treasures. I assure that a visit to our Province would not disappoint you if things were a little more…normal, you know? 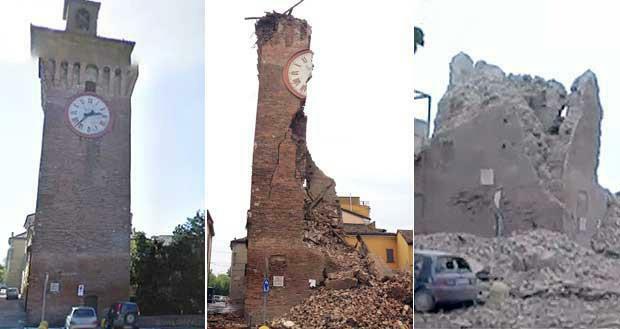 As many of you probably already know, an earthquake hit the Provinces of Modena and Ferrara and some Municipalities in Mantova, Bologna, Reggio Emilia, Rovigo. The Northern districts of Modena are hardly hit. Wie viele von euch wahrscheinlich schon wissen, wurden die Provinzen Modena und Ferrara und einige Gemeinden in Mantua, Bologna, Reggio Emilia, Rovigo von einem Erdbeben betroffen. Die nördlichen Bezirken in Modena sind stark betroffen. When I travel home for a while, coming from Salzburg, I usually take the train. The German-Austrian EC München-Bologna crosses the Po river in Ostiglia and then enters my homeland in Mirandola, nevertheless travelling far away from the beautiful city of the Picos. Finally the train crosses San Felice sul Panaro. Wide, open, fertile fields and the warm and beautiful centre of San Felice with the church and the castle used to be my welcome home. Not anymore, I guess. Wenn ich ein bisschen heim sein will, fahre ich mit dem Zug ab Salzburg. Der DB-ÖBB EC München-Bologna überbruckt den Po-Fluss in Ostiglia und kommt dann in meine Heimat in Mirandola, obwohl er weit von der schönen Stadt der Pico fährt. Endlich durchfährt der Zug San Felice sul Panaro. Breite, offene, fruchtbare Felder und die warme und schöne Altstadt von San Felice mit der Kirche und dem Schloss waren in der Regel mein “Willkommen heim”. Nicht mehr, befürchte ich. Thousands lost their home. Tausende haben ihr Daheim verloren. Migliaia hanno perso casa. Industries, shops, farms are closed due to damages or even destructions and thus we are not able to work in order to pay for repairing or rebuilding using our own wages. Industrien, Geschäfte und Bauernhöfe sind aufgrund der Schaden oder sogar der Zerstörungen geschlossen und deswegen können wir nicht arbeiten, um das Geld zum renovieren oder wiederaufbauen zu verdienen. How to help? Wie kann man helfen? 1) Buy products from Modena and Ferrara, so that we can rise again! Produkte aus Modena und Ferrara kaufen, so dass wir wieder aufstehen können! Grana Padano, prosciutto, salumi:try to check that they come from/bitte Herkunft möglichst kontrollieren: Mirandola, San Felice sul Panaro, Finale Emilia, Camposanto, Ravarino, San Possidonio, Cavezzo, Medolla (Prov. Modena), Crevalcore, San Giovanni in Persiceto (Prov. Bologna), Bondeno, Sant´Agostino (Ferrara). Biomedical equipment/devices and so on from/Medizintechnische Geräte aus Mirandola, Medolla, Concordia, Cavezzo, San Felice sul Panaro, San Possidonio, San Prospero, Carpi. We are going to organise several initiatives (i.e. in Salzburg and surroundings) you can help with or make a small donation for you can afford. I am a simple girl from the Modenese people, so you won´t have to fear that your efforts get wasted in political tricks. Our idea is: make industries and shops work again, so that we can rebuild houses and start rebuilding monuments with our own efforts, then funding reconstruction of monuments. We want them as they used to be, or even better. Wir werden verschiedene Initiativen organisieren (z.B. in Salzburg und Umgebung), in welchen ihr helfen könnt oder für welche eine kleine Spende möglich ist, die keine finanzielle Belastung wird. Ich bin ein einfaches Mädchen aus dem modenesischen Volk, also muss man nicht befürchten, dass eure Bemühungen in politischen Spielen weggeschmissen werden. Unsere Idee ist: machten wir Industrien und Geschäfte wieder produktions- oder arbeitsfähig, so dass wir die Wiedererrichtung der Häuser und teilweise der Monumente mit unseren Löhnen/Gehältern selber bezahlen können. Dann Wiedererrichtung der Monumente unterstützen. Wir wollen sie, wie sie früher waren, oder sogar besser! I am able to work with several groups on location(I plan to travel home on the 19th June). Especially people living around Salzburg could comment here in order to get in touch with me/Ich kann mit verschiedenen Gruppen vom Ort aribeiten (Ich habe geplant, am 19. Juni heim zu fahren). Besonders Personen aus dem Raum Salzburg könnten hier kommentieren, um mit mir in Kontakt zu treten. a) Banca Unicredit, piazza Grande 40, Modena. IBAN: IT 76 N 02008 02460 000102085251. 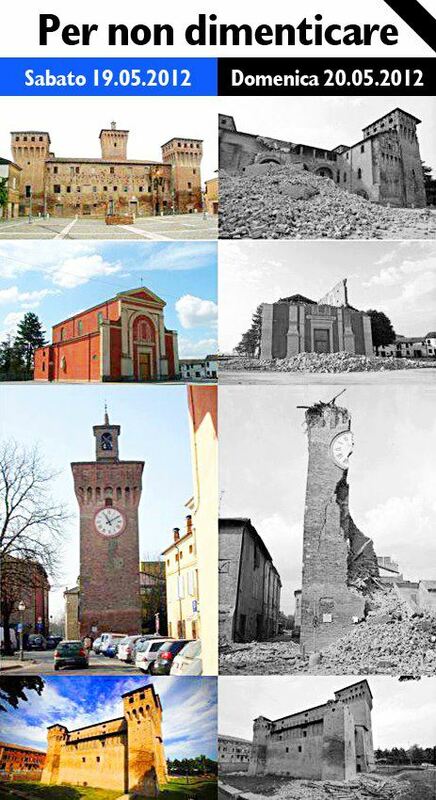 Causale/payment purpose/Verwendungszweck: terremoto in Emilia Romagna. Causale/payment purpose/Verwendungszweck “Emergenza terremoto Emilia”. causale/payment purpose/Verwendungszweck “terremoto maggio 2012”. Beneficiario/account holder/Kontoinhaber Bianchini Roberto per associazione “Rovereto insieme”. r) Save art and monuments! Kunst und Denkmäler retten! For further information or for ideas, contact me! Für weitere Informationen/Anregungen stehe ich gerne zur Verfügung! Please, ignore stupid comments or contents about pasta and insurances. The tragedy is that many people cannot work if their activities don´t sell these products, don´t have warehouses anymore etc…! /Bitte, dumme Kommentare oder Inhalte über Pasta und Versicherungen ignorieren. Die Tragödie ist, dass viele Personen nicht arbeiten können, wenn die Betriebe diese Produkte nicht verkaufen, kein Lager mehr haben usw…!